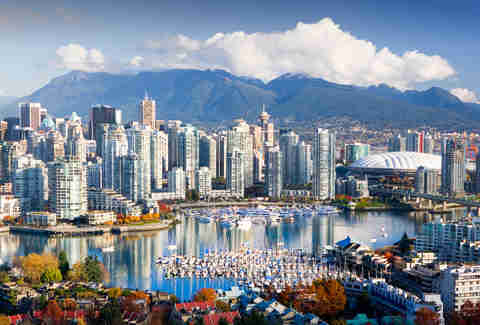 Vancouver is dazzling. It’s generously endowed with natural splendor -- snow capped mountains! Temperate rainforests! The ocean! -- but it’s also a vibrant city with a glassy downtown and dozens of unique neighborhoods to explore. OK, so it rains. A lot. The winter is notoriously wet, but honestly, so is spring and fall. The summer, however: *Italian chef kiss. * From June to September, life moves outside, to al fresco restaurants and breweries, and to the beaches and hiking trails nearby. And even on miserable February days, the dankness brings a certain moody charm (see: Twilight). 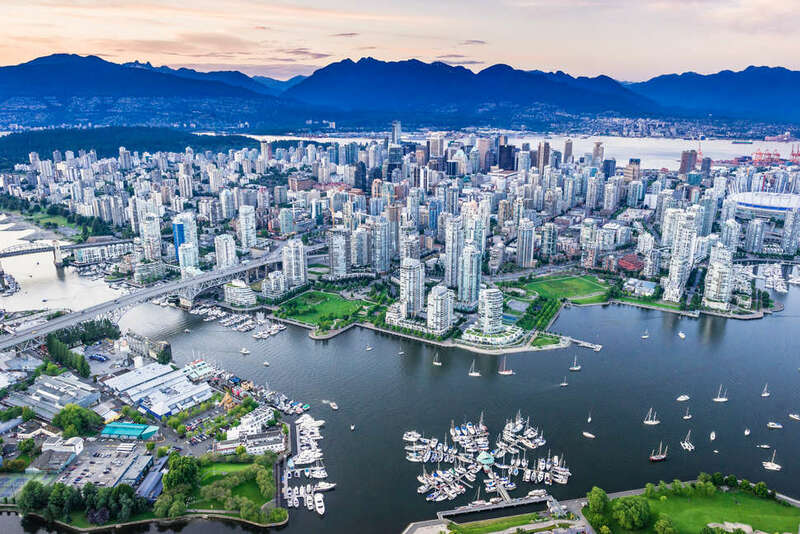 All in all, Vancouver is a beautiful place to explore anytime of the year (but really, if you can, try and go between June and September). For anyone planning a trip, here are the best things to do, places to eat, where to stay, and Important Intel to know. Vancouver might be Canada’s third biggest city, but you’ve got to get out of the urban center and into nature. It’s on the ocean, is replete with parks and beaches, and there are mountains nearby for hiking in summer and skiing in winter. 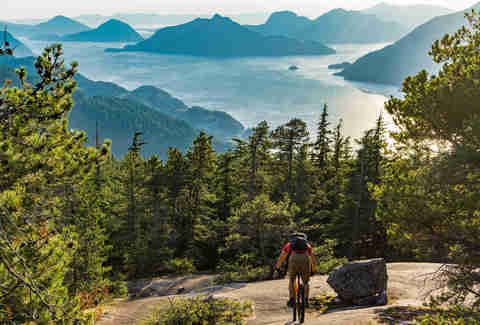 All in all, there’s an overwhelming number of outdoor activities to enjoy, including but not limited to sailing, whale watching, salmon fishing, ziplining, kayaking, swimming, paddle boarding, and biking. Vancouver summers, when the sun is shining but the lack of humidity means you can still cool off in the shade, are perfect for hiking. That said, winter hikes can be just as beautiful, when the forests become lush with rain. Drizzle is typical, but that shouldn’t stop you from taking long winding walks through any of Vancouver’s 230 parks, including the stately VanDusen Botanical Garden and the cedar-scented Pacific Spirit Park. Or you can get out of the city altogether. Grouse Mountain, a 20-minute drive from downtown, is a favorite local hiking spot. The 1.75 mile climb to the top, which ascends some 2,800 feet, is known as “Mother Nature’s Stairmaster” -- you can find out why the hard way, or take the aerial tramway. You’ll find an observatory at the peak and, on a clear day, Vancouver glistening below. 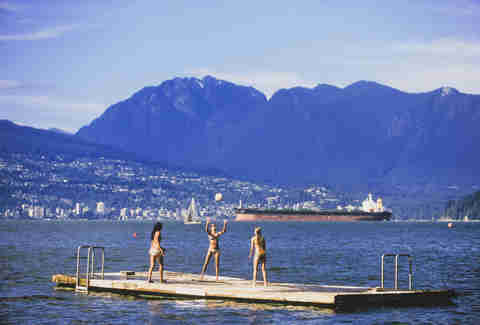 There are tons of beach options, including Kitsilano (excellent people watching), Jericho (more chill), Second Beach (on Stanley Park) and Wreck Beach (where clothing is optional). Sunning, swimming, picnicking, and barbecuing are (rightfully) the most popular beach activities, but for the more culturally minded, Shakespeare is also on the table. From June through September, English Bay hosts Bard on the Beach, Vancouver’s long-running Shakespeare Festival. Finally, if you’re looking for a wide-open scenic walk, head to Spanish Banks; at low tide, the waters recedes more than half a mile and you can walk right out onto the wet, rippled sand. 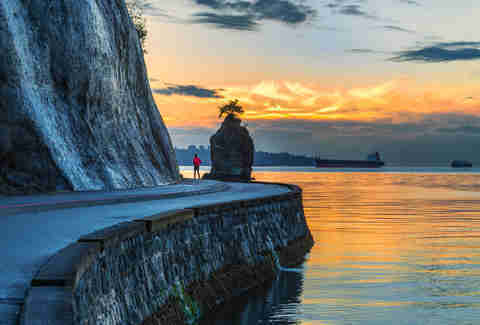 No trip to Vancouver is complete without a visit to Stanley Park, a 1,000-acre wooded expanse that juts into the Burrard Inlet. Rent a bike and do a lap around the 5.5 mile, beach-studded perimeter, known as the Seawall, which features views of the glassy downtown district to the south and blue-purple mountains to the west. The loop also makes for an excellent run -- the air is bracing and sea-salted, and the scenery is distractingly pretty. To dig a little deeper, head inside on one of the park’s many winding paths. Cathedral Trail, for example, will take you under canopies of massive, moss-covered pines, while Beaver Lake Trail has a lovely lunch spot by the lily-covered pond (you might recognise it from the Fifty Shades movies, if you were one of the suckers who actually paid to go see them). The museums aren’t bad either! The Metropolitan Museum it isn’t, but the Vancouver Art Gallery is worth a visit for the works by Emily Carr, the Group Seven, and Marc Chagall. But if you can only go to one museum in Vancouver, make it the Museum of Anthropology at the University of British Columbia. It’s one of the top anthropology museums in the world and the home to thousands of First Nations artifacts, including totem poles, textiles, and canoes. The museum is the main draw, but the UBC campus is beautiful in itself. After the museum, check out the Japanese Tea Garden or the Botanical Garden, where a suspended bridge leads over a canopy of Douglas firs, cedars, and grand firs. Arrive hungry -- the Vancouver food scene is overwhelming. Asian food is at the forefront (43% of Vancouver residents are of Asian descent) -- expect authentic omakase bars and some of the best dim sum anywhere in North America. 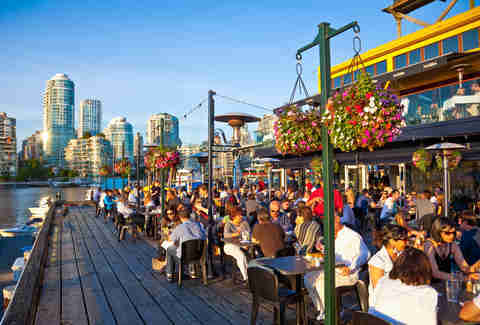 Let’s start with a tourist favorite: downtown-facing Granville Island. Its main draw is the buzzing market, where you’ll find seasonal produce, speciality meats, fresh fish, artisanal cheeses, dips, pickles, pastries, and so much more, every day of the week. Do a lap before deciding what to eat, then take your food out to one of the picnic benches on the False Creek waterfront (just watch out for seagulls). On the other end of the spectrum, fine dine on the seven-course tasting menu at Hawksworth, which is roundly considered one of the best restaurants in Vancouver. In Downtown, stop by the Flying Pig for Brussels sprouts and mac & cheese. Over in Yaletown, Homer Street Cafe and Bar does a dirty, delicious rotisserie chicken. In a city that averages 161 rainy days annually, a noodle obsession just makes sense. Vancouver has enough options for an extensive noodle crawl, but start with Kintaro Ramen or its sister Motomachi Shokudo, which serves up health-conscious takes on Kintaro’s rich pork broths, including bamboo charcoal miso ramen. Jinya Ramen, which has multiple locations, is also a consistently satisfying. For variety, try Harvest, a grocery store/restaurant that serves up udon, ramen, and rice noodles in homemade broths. And pho fans shouldn’t leave without a trip to Pho Goodness or Chau Veggie Express, which has an outpost on Granville Island (get the candle-lit lantern pho soup). 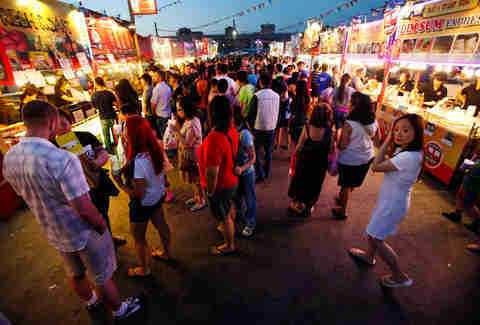 The Asian population is diverse, with large communities of Indian, Filipino and Korean residents alongside the Chinese. For authentic Hong Kong, Taiwanese, and mainland Chinese options, consider a trip to the suburb of Richmond. Seafood restaurant Parklane, HK B.B.Q. Master, and dim sum specialist Golden Paramount are worth the trip alone. Back in the city, here are the greatest hits: Kingyo for sushi; Suika for Japanese tapas, Vij’s for Indian, Sun Sui Wah for dim sum, Kirin for upscale Chinese, Raisu for bento boxes, Peaceful for xio long bao, Guu for Asian fusion, and Kissa Tanto for a mashup of Italian and Japanese. Vancouver’s Chinatown is the largest in Canada, with a dizzying array of places to eat. Go to Dinesty for dumplings, Bao Bei for Asian-fusion sharing plates, and Juke for casual chicken strips. But if you only eat one thing in Chinatown, make it the fried chicken from Phnom Penh, followed by the butter beef and sour soup. Vancouver’s walkable downtown is worth exploring. 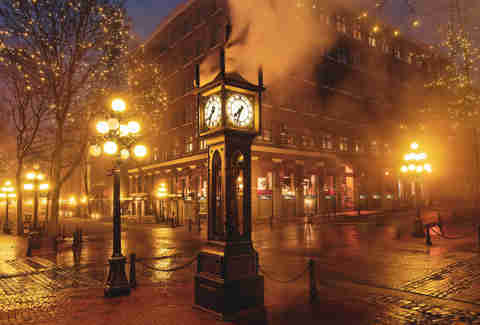 Start with Gastown, a historic (once drug-ridden) district that’s now a cobblestoned tourist attraction. The steam clock is the neighborhood’s most famous fixture, but the real draw is the collection of boutiques, coffee shops, and cocktail bars. Head to The Diamond for a Canadian take on the Sazerac. Next, head to Strathcona, Vancouver’s oldest residential neighborhood. The local favorite for pie to go is Pizza Farina, and next door there’s The Boxcar, much-loved for craft beers and cocktail bars on the patio. Or check out Strathcona Brewery, one of many Vancouver breweries, which has a long list of seasonal microbrews. After the 2010 Winter Olympics, the athletes’ village was converted into apartments. Today, it’s a popular neighborhood full of bars and restaurants -- top pick is the Craft Beer Market, which has more than 100 beers on tap and one of the best burgers in the city. Kitsilano, a beachside neighborhood just outside of downtown proper, has a relaxed vibe. Take a walk along the water, and then head to the Local for beers on the patio. The main drag for food and drink is West 4th; local favorites include Tractor, with its heaping grain bowls, and Kokomo, for vegan dishes. There are tons of quaint artisanal brunch options in Vancouver including The Birds and the Beets in Gastown and Fable on West 4th. But leave all that farm-to-table stuff and go to Earls instead, which is like an upscale Canadian Outback with locations all over the city. The music is usually too loud, but you’ll get a great deal if you go before noon: brunch items are $8 to $10, and cocktails are $5. Coffee culture isn’t quite on the same level as in Seattle, but the brews themselves are just as good. There are lots of solid places, but none better than Nemesis Coffee in Gastown, JJ Bean Coffee Roasters, or Matchstick, where you can (and should) get the baked beans, kale pesto, and soft eggs on toast to go with your latte. Failing that, there’s always Tim Hortons, Canada’s version of Dunkin Donuts (but better). Locations are scattered around the city; order a coffee, a donut, and a box of Timbits for the road. Weed is legal…wait for it... now! Vancouver has long had a lax attitude towards marijuana, perhaps because British Columbia is such a big producer of the stuff (did I mention it rains a lot?). But certain forms of cannabis will be legal as of October 17, 2018, when Canada will become the second nation to legalize the drug recreationally (hey, Uruguay). If you’re over 18, you’ll be able to buy fresh or dried cannabis, cannabis oil, plants and seeds at one of the many stores ready to fling open their doors. If money is no object (lol), Vancouver has a variety of luxury accomodations. The swankiest is the Fairmont Pacific Rim, with its outdoor pool, self-serious cocktail bar, and panoramic views of Coal Harbour. Other high-end options downtown include the Shangri-La Vancouver, the Rosewood Hotel Georgia, and the Four Seasons. If money is an object, and one worth looking after, there a bunch of good hostels including Pacific Spirit Hostel at UBC, Hostelling International, and Samesun Hotel. People tend to dress pretty casually, and you’ll see a lot of athleisure windbreakers, leggings, and yoga pants (the city is the birthplace of Lululemon, after all). For high-end fashion head to Holt Renfrew, Canada’s version of Barney’s. It’s in the heart of downtown, near the rows of shops on Robson Street (home to one of the first Aritzia locations -- another chain that was founded in Vancouver). A ton of movies and TV shows have been shot in Vancouver, which often serves as a stand-in for Seattle, Portland, or even New York. In downtown, keep an eye out for The Marine Building (which as been featured in Blade: Trinity and Fantastic Four), or go to Point Grey Secondary school to see where both Lara Jean Covey (in To All the Boys I Loved) and Amanda Bynes (in She’s the Man) attended classes. 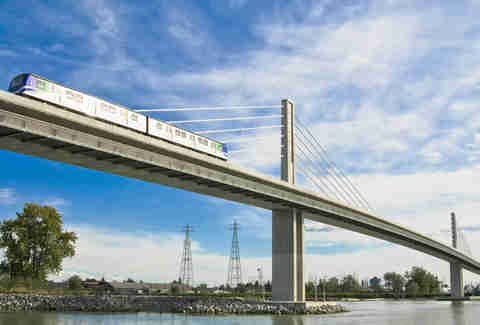 Downtown Vancouver is highly walkable, and to get to more far flung neighborhoods you can take the bus or the SkyTrain. The most scenic (if not always convenient) option is the ferry, which shuttles foot passengers back and forth from Granville Island, downtown, and around False Creek. Most airports look like trash next to the pristine cleanliness that is the Vancouver International Airport. The light-filled terminals are sparkly, somehow smell great, and there’s even a museum that you walk through on your way to customs. Oh, and there’s a massive waterfall. Seventy-five miles north of Vancouver -- about a 90-minute drive without traffic -- is Whistler, one of the world’s top ski spots. 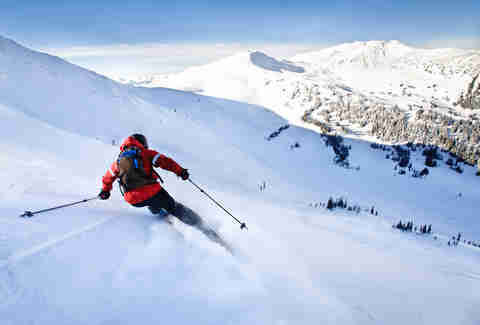 In the winter, expect vacationers from all over the world hitting the slopes. But the ski-town is also worth a visit during the summer, when the crowds are less intense, the sun is shining, and the hikes are plentiful. The food isn’t bad, either. You can combine Vancouver with Seattle (142 miles away) and Portland (316 miles away) in a Pacific Northwest itinerary. Drive it on the I-5, or take the Amtrak Cascades line, for a more relaxing way to see the scenery.